Not ready for rehab but ready for change? Can’t afford rehab? Luckily, gone are the days that inpatient treatment is the only way to get sober. Many alternatives to rehab are not only affordable and accessible, but also offer evidence to back them up. We have nine alternatives to help you on the path to addiction recovery. Addiction treatment has come a long way since the 1930’s. Medication can not only help co-occurring disorders like anxiety and depression, but there are also specific medical treatments that are now proven to help you quit smoking, reduce alcohol cravings, and make it through opioid withdrawal. How to get started: Workit Health offers medication for opioid addiction in Michigan and California. To get medical treatment for addiction, check for addiction medicine doctors (the American Board of Addiction Medicine has a directory) or psychiatrists near you. Some insurance providers may require a referral, so your primary care doctor is a good first visit to start with. They may also feel comfortable prescribing some meds themselves. You’ve probably heard that meditation can help with stress, but did you know it can also help with addiction? Studies have shown that meditation can boost brain chemicals and reduce relapse. Meditation can help us gain awareness of our triggers and cravings without acting upon them. An entire support group, Refuge Recovery, has built up out of meditation and Buddhist beliefs in the last few years. How to get started: Refuge Recovery offers a basic set of meditations for free on their website. If you try it and it feels good, you can always order their book, Refuge Recovery, to learn more at home. Luckily, meditations are not hard to find thanks to technology: search for meditations on YouTube, or try a meditation app like Insight Timer, Headspace, or Calm (most require a paid upgrade to access all features). Set a small goal for yourself, like meditating for a few minutes each morning. Ready to start now? Try out this Body Scan meditation from Workit Health. Luckily, you aren’t the first person to struggle with addiction even if it feels like you’re incredibly alone. Many people have made it through exactly what you’re going through. People in recovery who professionally keep others accountable with their own recovery goals are called recovery coaches, and it’s a growing field. Is peer recovery coaching effective? Many studies have been reviewed and the evidence shows that recovery coaching is absolutely beneficial. How to get started: Workit Health offers online recovery coaching all over the U.S. Sign up now and have 24/7 to a recovery coach to keep you on track. If you’d rather meet up with someone in person or over the phone, check your state’s local peer recovery coaching options through a Google search. Recovery community centers may act as a local hub to help you find a coach. For example, Connecticut offers a Telephone Recovery Support network. In Austin, Texas, Communities for Recovery allows people to find a coach in their area. 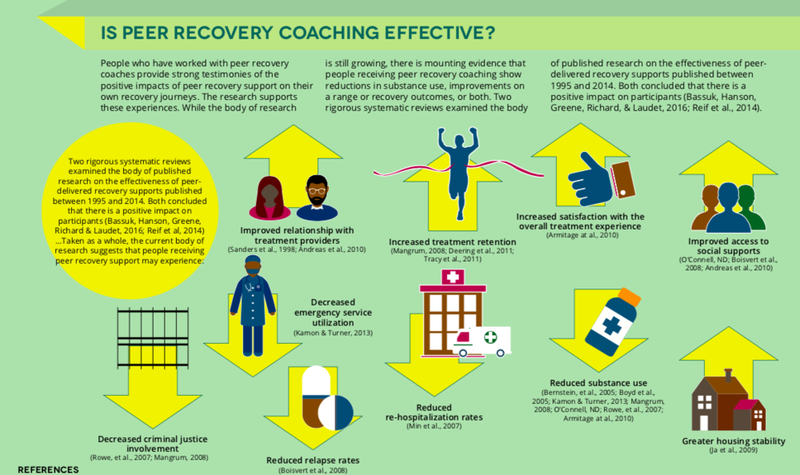 Recovery coaching infographic via SAMSHA. There are so many different types of therapy, that could be another blog post entirely. A therapist can help you with past and current issues and challenges, in your addiction recovery and life in general. A therapist can work with you one-on-one or in a group, depending on how you feel most comfortable. Several types of therapy work well for addiction, including Cognitive Behavioral Therapy and Motivational Interviewing, have been proven to work well for addiction. Many therapists specialize in treating addiction, and will pick and choose techniques best suited to handle your specific issues. How to get started: Workit Health offers online therapy for addiction, as do companies like TalkSpace and BetterHelp. Directories like Psychology Today have a large network of therapists to choose from, with both group therapy and individual therapy options available. If you’re ready to go to treatment but not ready to ask for time off of work, or just can’t afford a 30-day stay at rehab, an intensive outpatient program might be the right choice for you. Instead of staying in a facility for 30 days, you attend daily therapy and classes, and then return home. Programs usually take up about 10-12 hours a week, depending on the level of care. A study in 2014 found that outpatient programs are just as effective as inpatient treatment. In an outpatient program in your local area, you’ll also be able to receive therapy for situations which come up in your day-to-day life which you’re unlikely to encounter during a rehab stay. Peers you meet will more likely be from your local area, and help you establish a local recovery community. How to get started: If you have insurance, you can call the number on the back of your insurance card to find an outpatient program near you accepting new patients. If you don’t have insurance, search online for outpatient centers with scholarship programs near you. 6. Supplement and Nutrient Therapies. When drinking and using, our nutrition and diet are the last things on our mind. This is why eating healthy in recovery and getting nutritional therapy can be the optimal choice for some people. We live in the age of biohacking, and new nutritional therapies for addiction are being developed all the time. Many swear by the coenzyme NAD to assist in recovery, and others believe that amino acids can help mood and recovery. How to get started: A functional medicine doctor or naturopath can evaluate your current health and recommend supplements for you. If you’re not ready for an appointment, you can buy basic nutritional supplements at your local pharmacy and focus on eating whole foods. Remember when shopping online, supplements aren’t regulated by the FDA and some can be addictive themselves. If you’re ready to find affordable, accessible support you can’t go wrong with peer-support groups. 12-step groups like Alcoholics Anonymous and Narcotics Anonymous are donation-based and very popular. If you aren’t in a rural area, chances are you will be able to find a group meeting near you at some time this week. These are just a few of the many groups out there, and if you don’t find one you resonate with, you can always post on meetup.com and try to find people looking for the same sort of support you are. How to get started: Pick a meeting near you and check it out! If you’re intimidated, see if the group you are interested in has a hotline you can call and ask any questions you might have about your first time. You can always try out an online meeting at InTheRooms.com before heading to the real thing. How to get started: Find a new healthier replacement for your addiction, like a hobby or passion. Take up exercise and build out a healthier daily routine. Focus on what would make you happy (other than drugs or alcohol), and take steps in your life to get there. Not sure you’re ready to quit, but still ready to take steps to improve your quality of life? Welcome to harm reduction. While abstinence-based recovery is largely black and white (you are on the wagon or off), harm reduction lives in the gray. It encourages people who use drugs to use them safely and responsibly, and empowers drug users to make positive choices. How to get started: Print out and complete this workbook from here to help which includes harm reduction strategies. If you find it helpful, then buy the book Over the Influence: The Harm Reduction Guide to Controlling Your Drug and Alcohol Use as a clearer guide. Ready to start your recovery journey?